We know how important it is to teach foundational principles and meaningful lessons from the Bible to your Sunday school children. 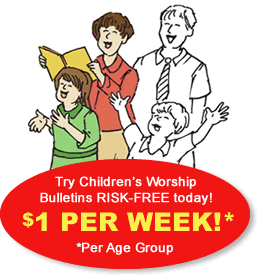 That's why we've carefully designed Children's Worship Bulletins by using proven educational methods. Christian educators and pastors of all denominations have endorsed the content of our bulletins. Because our bulletins teach basic Scripture knowledge, not doctrine, they're perfect for all Christian churches. Having a foundation of biblically based Sunday school materials makes it easy to create wonderful Sunday school activities that your entire class will enjoy. In this brief article, we'll show you two examples of Sunday school activities you can use with our bulletins about Joseph. Try these in your next class! Sunday school activity about Joseph for ages 3-6: Joseph's brothers sold him to some merchants. Instruct the children to complete the puzzle, "Joseph's brothers sold him to some merchants." 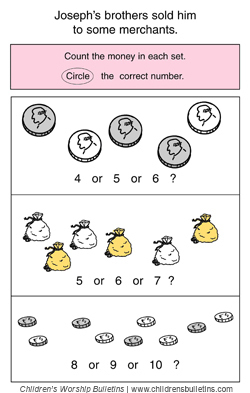 Have the children add the answers from each of the three panels in the puzzle (5 + 6 + 9 = 20) or count the total amount of money shown in the puzzle (20). Explain to the children, "Now that we've finished the puzzle, let's hear the story about Joseph. Raise your hand when you hear for how many shekels Joseph's brothers sold him." Ask the children, "For how many shekels did Joseph's brothers sell him, according to the story? Does your answer to the puzzle match the story?" Sunday school activity about Joseph for ages 7-12: Joseph said, "I am your brother ... "
Divide the children into teams of two or three students each. Give each child a bulletin and each team a pencil and a sheet of paper. 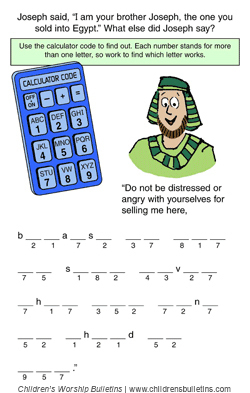 Instruct the children to work together as a team to complete the puzzle, "Joseph said, 'I am your brother ... '"
Explain the activity, "Now that you've solved the puzzle by using the code numbers from the keypad shown in the puzzle, we're going to make our own team puzzles with another verse from our story. "Next, add at least one letter clue to each word. "When your team has completed their puzzle, turn it in." After each team has turned in their puzzle, explain that the other teams will now solve one another's puzzles. Distribute the puzzles so that each team has another team's puzzle. Allow the children to solve the other team's puzzle. The first to finish the puzzle correctly is the winner. Give each member of the winning team small prizes. You can rest assured that Children's Worship Bulletins will provide meaningful and relevant information that is both educationally and theologically sound. This peace of mind is invaluable, saving you time and money. You no longer have to spend hours searching the Web for credible Sunday school activities or pay for materials that you'll never be able to use.